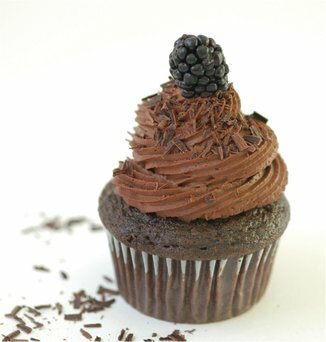 A rich chocolate cake with a creamy mousse topping, this is a classic cupcake combo for chocolate lovers. Of course, you can use this cupcake without the mousse for all your basic chocolate cupcake needs. Prepare the mousse first so that it has time to set, and garnish the cupcake with a berry and chocolate shavings, if you like! This recipe is modified from Vegan Cupcakes Take Over The World. Crumble the tofu into a blender. Add the soy milk, agave and vanilla extract. Puree until completely smooth. Set aside. In a double boiler, melt the chocolate chips. Obviously you don’t have a double boiler so take a small sauce pan and fill half way with water. On top of that place a small sauté pan. Fill the sauté pan with chocolate chips and bring the water to a boil. Use a rubber spatula to mix the chocolate as it melts. Once melted, remove from heat and let cool for 5 more minutes, stirring occasionally. Add the chocolate to the tofu and blend until well combined, use the spatula to scrape down the sides of the blender every so often. Transfer the mousse to an air tight container or a bowl covered in saran wrap and let chill for an hour. Preheat oven to 350°F and line a muffin pan with paper liners. Whisk together the soy milk and vinegar in a large bowl, and set aside for a few minutes to curdle. Add the sugar, oil, vanilla extract, and other extract, if using, to the soy milk mixture and beat until foamy. In a separate bowl, sift together the flour, cocoa powder, baking soda, baking powder, and salt. Add in two batches to wet ingredients and beat until no large lumps remain (a few tiny lumps are OK). Lightly spray the liners with cooking spray and pour batter into liners, filling 3/4 of the way. Bake 18 to 20 minutes, until a toothpick inserted into the center comes out clean. Transfer to a cooling rack and let cool completely. Once the mousse is chilled and set and the cupcakes have cooled, remove from the refrigerator and stir with a fork to a spreadable consistency. Fit a pastry bag with a wide decorating tip. Fill the bag with mousse and pipe it onto the cupcake in a spiral, starting from the outside in or in. Add chocolate chips or chocolate shavings if you are feeling especially fancy pants. Chill the cupcakes or a half hour to let the mousse set again and serve cold. This looks crazy-good! Got – to – make -now!! Yummy! Will have to make these this weekend! I am allergic to soy so is it ok to substitute for rice or almond milk, or will it always have the wrong texture? I break out like a madwoman ALL over from soy and it is in EVERYTHING. Yes, I actually use almond milk now, too. My mousse topping didn’t come out as firm as the picture appears – any ideas why? Still very delicious though, just not as pretty. I had to make them gluten free and I used Bob’s Red Mill baking mix and a little xantham gum and they are perfect! Awhh nuts, same! I tried making the mousse and it was more or less a chocolate pudding. I do believe I did everything correctly? Plan to make this weekend…any tips on the mousse in reference to the above two posts? Do you need to press the water out of the tofu first? Thanks! Honestly, this recipe has been published for over 5 years now and this is the only time I’ve heard that it isn’t firming up. I would just make sure to give it enough time in the fridge! It will firm up. If it’s in the fridge for an hour and still hasn’t firmed, just give it a but more time, I promise. These look awesome! Quick question- i could only find Firm silken tofu at the store…can i use that? Does the tofu have to be drained & pressed? Would it be ok to substitute coconut oil for the canola in this recipe? I absolutely LOVE your Vegan Cupcakes Take Over The World! I am new to vegan everything and am just getting my feet wet. I am a long time baker but have a question about your cupcake recipes. I made both chocolate and lemon recently. Upon removal from the oven, they are perfect. I cool them thoroughly and then put them in a covered container…they always get extra moisture on the top, which wasn’t there before. Does this happen to you as well? Any solutions? Of course, I guess it’s better than being dried out! 🙂 Thanks Isa. Yes, condensation is totally normal. Try putting a paper towel loosely on top, that at least will absorb it somewhat. Made these today and they’re fantastic! I had no problem with the mousse–it’s very similar to a pie filling I make. Will definitely make these again. Thanks for sharing!!! These were amazing! I’m very new to the vegan lifestyle and these helped in the persuasion of my family… especially my hubby. I was wondering though, do you have any raw cupcake recipes? This has become my new go-to recipe for cupcakes!!! They’re amazing. I made them with coconut milk instead of soy milk when I first made them and it added a really nice flavor to them. Thanks for the recipe! I made these this morning and the mousse came out excellently firm! I made them for a lactose intolerant coworkers birthday and they were all very amazed! Some had two (I made a double batch). Thanks for the recipe. BTW if the mousse isn’t setting as firm as you’d like it, either leave it in the fridge longer or reduce the non dairy milk. The mousse took about 3 hours to be perfect for me. It is SO good. I made it for the Mexican hot chocolate cupcakes, which my 10 year old son has deemed “God’s perfect cupcake”. The only thing is, I cannot get them to not sink in the middle. It is so frustrating. I have checked my oven temp. and really tried hard not to overmix. I made two different batches yesterday. Any ideas???? I love all the cupcakes from Vegan Cupcakes Take Over the World. I make them all the time and always have success. I have had many people tell me they are the best cupcakes they have ever eaten, not just the best vegan cupcakes. Anyway, I turned this chocolate cupcake recipe into my wedding cake. It was awesome! I made the batter into cakes, then poured a little amaretto and raspberry jam mixture over the cake to keep it moist. I then made the chocolate mousse from the book adding more amaretto and espresso powder. The frosting was vanilla buttercream, also from the book but made with amaretto instead of milk. Anyway, thanks. The mousse is fantastic! I brought a batch of mexican hot chocolate cupcakes to work, and people raved about the frosting. It was so satisfying telling them that the frosting contained an *entire* box of tofu. I don’t have any mori-nu on hand, can I use regular firm tofu? The cupcake part of this was perfect, but the mousse was TOO firm. I almost considered rolling it up in little balls and dipping them in melted chocolate and cocoa to make vegan truffles because it tasted so delicious, but it was a little much on top of the cupcakes. I guess next time I’ll just thin it out with more non-dairy milk. I like the idea of using coconut milk, too. Sounds like a delicious substitution. Anyway, thank you for an awesome recipe!! Everything was so moist and delicious and oh my god. I decided to make these for a Secret Santa at work for a girl who can’t have the animal proteins in milk, but who I was told liked Junior Mints. I used “vegan chocolate chips”, replaced the extract in the mousse with mint extract, and did the same with the almond/extra vanilla in the batter itself. Everything came out perfectly. I think this just became my go-to cupcake recipe, way more than anything non-vegan. I make both the mousse and cupcake all the time, but the first time i made the mousse it was a little too drippy for piping, then the next time i made it, I left it in the fridge overnight before making the cupcakes and it piped just as pretty as in the picture! It also tastes amazing. As a fun addition I’ve been filling the chocoloate cakes with ganache for extra moistness. Killer. I just made the Brooklyn Brownie cupcake recipe from your book. Awesome. Raving reviews. I love it. I made these with the basic chocolate frosting but since I had no shortening I used earth balance margarine and coconut oil. That worked okay, but I will try this frosting instead 🙂 love the book! Is there anything you can substitute the tofu with. Based on people’s reviews, I made sure to chill the mousse for several hours before I needed it, especially because I used firm rather than extra-firm mori-nu, and it was ahhhh-mazing. I only iced the cupcakes with a knife though, so although I made a double batch of cupcakes, I needed less than one batch of mousse (I used about 2/3). I could see how you could use more of it though if it was piped on. I also discovered the hard way how important it is to let the cupcakes cool completely before icing, as my first attempt almost tore apart one the puffy cupcakes. Are there any recipes in the book with no oil? i am vegan and also don’t do oils. Nope! You can replace oil with applesauce or other standard subs, but they will be more like muffins. I made these the other day. They are INCREDIBLE! I brought them into work for our office potluck and didn’t tell anyone that they were vegan. Everyone loved them! One of my co-workers said that they were the best cupcakes that he had ever had! When I told them they were vegan, everyone was so shocked! It was great! 😀 Thanks for the awesome recipe! Amazing! The best cupcakes I have ever had. I thought I’d give some away, but changed my mind 🙂 SO GOOD!! I only had 3/4 of the tofu for the topping (used the other 1/4 went to chocolate bottom macaroons) so I used a little less almond milk and a little less chocolate, and let it sit in the fridge for like 3-5 hours, turned out great! I keep the cupcakes in the fridge, and the topping is firm but creamy and the cake part is so moist. Thank you! I’m allergic to both soy and almonds, so neither of those milks work for me. Instead, I always use SoDelicious coconut milk (either vanilla or original) in this recipe and it turns out perfectly! I still haven’t tried the mousse because I’m wondering if I’ll be allergic to the tofu due to the soy. Is there any other way I can make vegan mousse topping for this cupcake? I just made these yesterday for my best friend’s birthday (she’s vegan, I’m vegetarian-bordering-vegan) and they turned out absolutely delish! My mousse didn’t firm up quite as lovely as in the photo, but it was still fantastic! We each had two, and whatever is left she’s taking with her to her family’s house over the weekend to prove that “vegan” and “sweet dessert” aren’t mutually exclusive terms. I have all the ingredients here except the soy milk. Can I use coconut milk instead? Used Almond Milk, no problems. Mousse turned out perfectly! Let it chill 2+ hours before frosting. Makes a ton of frosting! Will bake another batch of cupcakes and try with Bob’s Gluten Free flour and coconut sugar instead of refined sugar. I’ve made these a few times before and absolutely LOVE them! I’d love to use the same recipe for a double layer cake. Any idea what changes I might need to make to baking temp and time and pan size? Best cupcake recipe I ever made! We sold them at our worlwide vegan bakesale day. Absolute success! Definitely have the same concerns as those above re: mousse too runny. I left my batch overnight in the fridge because it was just not setting. It still looks like chocolate pudding to me. Don’t get me wrong – very tasty – but pudding like. Can you give me a substitute for silken tofu.secondly can I use cottage cheese instead of silken tofu.please help me at your earliest. Samantha – use avocadoes and melted choc with agave syrup. Im not sure if you are in Australia or USA. We can use confectioners sugar as it doesnt have bone in it….. I would use this, we call it icing sugar – with pure vanilla and melted raw coconut oil and all of the afore mentioned to make something without nuts and soy. I doubled the cupcake recipe, poured it into a 9inch or so cheesecake pan, baked it for probably 40 minutes (I checked every 10 minutes after 20 minutes was up), sliced the caked in half horizontally, and put the mousse on the inside as filling between the two halfs. Then topped the cake off with ganache poured on top 🙂 SO GOOD!! Fantastic recipe! Delish. Tip: Double the cupcake recipe to make 22 cupcakes. I made these cupcakes for my daughters that have allergies to dairy and egg. I have made NUMEROUS vegan recipes, however, these cupcakes were by far THE BEST vegan chocolate cupcakes that I have ever made! Some vegan recipes turn out dry and others are too dense. These were absolutely perfect. The cupcakes were moist, light and airy. I did not make the accompanying frosting recipe because I used a vegan buttercream instead. I will definitely only use this recipe for chocolate cupcakes moving forward! I’ve been making these forever, but don’t use the frosting if they can’t be refrigerated. Does the frosting actually need refrigeration – or could I bring them to an outdoor birthday party? This is my go to cupcake recipe. My only change is to increase the cocoa to 1/2 cup. This makes the cupcake a bit denser and even more chocolatey! The mousse is fantastic, but I’ve mixed things up by using a vegan buttercream frosting – mint, coconut, vanilla, banana, maple… I’ve used almond milk, coconut non dairy milk, brown sugar, coconut sugar… This recipe works perfectly every time and is always a hit! Thank you, thank you, thank you!!! I love this recipe, and am making next week-end for a world vegan day bake sale! I would recommend making the frosting without the milk and adding it only if the texture is too stiff. There are too many kinds of tofu out there to get a consistent result. I love your books, everything turns out perfectly! How do you get the tofu completely smooth? My blender still leaves tiny chunks because everything sinks to the bottom. Would I be better off mashing it and then beating with an electric mixer? Weird, that doesn’t sound right. Just blend until it’s smooth, using a spatula to stir every now and again. Perhaps you just need to blend a bit longer? I’ve tried that but everything just collects below the blades. I think I need to stop being such a cheapskate and get a better blender! :) I’ve been VCTOTW cupcake crazy this week. Cappuccino Cupcakes on Thursday, Maple Cupcakes on Friday and Crimson Velveteen Cupcakes today! Hello, do you think I could make these as a cake? If so, how many minutes and what temperature would you recommend? Thanks! Can you make a cake with this same recipe? Or would it fall apart? Ha! too funny the person before me just asked the same thing. I just finished reading all the reviews and one person did make a cake out of the recipe. i’m so excited to finally have a birthday cake to make for vegan friends and family! Thanx! Isa, your recipes are the best! I just made a batch of the marbled cupcakes. Mmmm.. In your book you say that adding some agar powder can give the cupcakes shiny tops. How much water do I need to use to dilute the agar before adding it in? I added 2 tablespoons of finely ground flax seed, substituted apple sauce for the oil and used a full tablespoon of baking soda. It came out so good, and less oil (which I like) – but still very moist! Yum! Thanks for this awesome recipe. These look amazing. I’d like to try them for a friends birthday and wonder if they can be made ahead and frozen? I have your cookbook “vegan cupcakes” and those are the cupcakes I made for my bday…lol, they are delicious. I love your cookbook! This is a general question: Can I use fresh coconut milk (I live in India) instead of soy or almond/ Soy/almond milk is relatively expensive here. If not, can I use rice milk? If so, is it a 1:1 substitution or should I dilute the coconut milk with water? I would use rice milk as first choice, or yes, dilute coconut the coconut milk with water to a dairy milk consistency. My first vegan cupcake baking trial went well with this recipe. Came out very moist, almost too moist but as they cooled they got more dense and crumbly like cake. I may add in the future more cocoa if that wouldn’t throw off the balance w/ the baking powder and soda (?) because I like my chocolate very rich. Anyway, super tasty and easy! Thanks, I look forward to getting your cookbooks! For frosting I just veganized a ganache recipe: soy milk + semisweet baking chocolate came out super smooth and went on pretty. Hi, what are your thoughts on using whole wheat or whole wheat pastry flour in chocolate cake/cupcakes? I love all your cupcakes from your cookbook, but I have always used AP flour. For this, I recently made a peanut butter mousse and used a melon baller to hollow the cupcake and filled it with the peanut butter mousse. After filling, I recapped with cake cork made by the melon baller. It was a huge hit! It would probably also be great if you made a raspberry mousse filling. i couldnt find silken tofu, just regular extra firm tofu. will that work too? Do you happen to know how much cacao powder to use for the mousse? Vegan chocolate chips are hard to come by here where as the powder is much easier to find. Yummers! Just made these for my chocoholic 8 year old. LOVE the fact that the frosting isn’t margarine based and is so creamy. I even spiked it with a little raspberry vodka for us adults:-) Thanks for the new go to cupcake recipe! The vacuum sealed type of tofu is not the kind that comes in the little tray with liquid, right? Should I try & press the liquid out? Or is it fine as is? It’s a realllllly different texture. Don’t even try these with the fresh stuff packed in liquid. isa, these are fantastic!!! The mousse came out thick and delicious without even putting it in the fridge (depends on the amount of water in the tofu…). The chocolate sponge cake base is so easy to make and very moist. Everybody loved them! I haven’t tried the mousse but I just tried the cupcakes (with a simple coconut oil “buttercream” frosting). My family went gluten free on January 1 and my baby’s first birthday is on the 11th, so I needed a good cupcake recipe QUICKLY! I tried this recipe subbing Bob’s Red Mill all-purpose baking flour and my cupcakes came out great! I had first tried a cupcake recipe from a fancy vegan/GF bakery and they were not suitable to serve to my omni-gluten-eating extended family. These totally are! I subbed almond milk for the soy milk and refined coconut oil for the canola, and used almond extract as the optional extract. Great flavor and texture! Thank you Isa!!! I was hesitant to try this mousse frosting because I was really convinced it would taste like tofu. I used the same brand as recommended because in my experience different brands can have different consistencies and flavors. It came out amazing! I made it the night before and put it in the fridge, and let it sit outside the fridge for an hour before using it. It was firm enough to hold its shape, the first vegan frosting I’ve ever made that hasn’t melted all down the cupcake at room temperature. Now for a vanilla version. OMG! This looks amazing! I just want to it it now!!!!!!! I’ve made these cupcakes before with your chocolate ganache recipe and they were great! I was going to try them with this mousse and was considering filling the center of a baked and cooled cupcake with the ganache (sort of “inject” the cupcake with it, for lack of better terms haha). Do you think that would work okay or would the ganache get all weird inside the cupcake? Thanks for the inspiration! This is very good mlg quickscope I am Russian!!!! My favourite number is 8! I’ve made these scrumptious cupcakes numerous times and they are always a big hit! The chocolate mouse topping is amazing! Thank you for sharing such a great recipe! Made a batch of these last weekend… I whipped up 24 mini-sized (reduced the baking time to 8 minutes) and they were AMAZING! The mousse turned out perfectly and was to die for… My omni-friends couldn’t believe the frosting was made from tofu and that the cupcakes tasted so delicious. I’ll definitely be making more of these! I’ve used this recipe a million times. Not for cupcakes, but for delicate truffles! I often skip the soymilk, but add a little liquor instead, such as contreau. Then I put in it the fridge overnight, and the next day I’ll form it into little truffles, and either coat it with melted chocolate, or (this is what I do the most) roll them in pure cocoa powder, cocoa powder mixed with licorice powder (I’m Danish) or cocoa powder mixed with maldon sea salt flakes. Perfect with a glass of good port! I just won our workplace cupcake challenge with this–I added half a frozen banana to the mousse and a sprinkle or two of cayenne to the cake. Almond-coconut milk instead too. Thanks ! I’d suggest chilling mousse for at least two hours though. These look good! I am going to try to follow this recipe to a T, with the exception of adding a little extra cinnamon. Can this be made into a cake with chocolate mousse filling? I had to use fresh, super firm tofu which came packed in a container of water, and it was fine. If anything, the mousse was so firm i needed to add a little more soy milk before piping it. The mousse is heavenly. That was incredible i love this recipe since i found it i make it once a week!